Dawn Ostroff and Ben Smith are our guests this week. Original Air Date: June 15, 2013 on SiriusXM “POTUS” Channel 124. My friends will tell you that, if we’re up in Windham, have had a cocktail or two, and we’ve flat out run out of things to do, I’ll head to the VHS rack. There I’ll put my fingers on a hand labeled cassette circa March, 1998 hand-labled “West Wing.” I’ll pour another glass of whiskey, and one for my guest (prisoner), and we’ll screen my one-and-only dramatic television pilot — WEST WING — shot for Lifetime Television in January and February of of that year, and starring Annabeth Gish, Marcia Cross and Peter Francis James. The pilot was directed by Allan Arkush, with Tammy Ader and Jonathan Prince serving as executive producers, based on an idea created by my pal Robert Wells and me. With that pedigree, how could it fail? 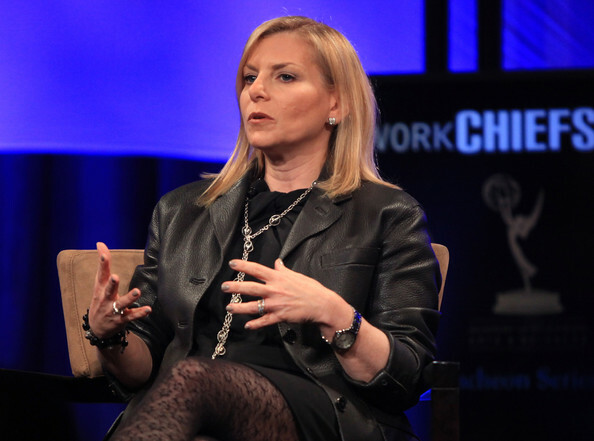 My first guest, Dawn Ostroff, is president of Condé Nast Entertainment, now executing on the mission to create, largely from scratch, the TV, film and digital platforms for the publishing empire whose brands include Vanity Fair, Glamour, Vogue, The New Yorker and Wired, among many others. Dawn came to Condé Nast from the CW Network, again created from scratch, which carved a crossover niche through shows like GOSSIP GIRL that originally made their mark through traditional cable pipes but eventually traveled with its young audience online, legally and otherwise. And yet, way back in the 1990’s, Dawn Ostroff was Dawn Tarnofsky, the suit at Lifetime in whose hands the fate of my one-and-only pilot rested. She had a wealth of data to analyze, drawn from the hands that held response cards of scores of test viewers among the Lifetime target demo. It was they who eventually concluded that our opposition in pilot testing, ANY DAY NOW, made for better appointment viewing than our story of a young Deputy White House Press Secretary (Gish) whose college roommate-turned-White House Correspondent (Cross) did daily battle amid the drama in the briefing room and beyond. What we couldn’t execute well enough, Aaron Sorkin did flawlessly 18 months later when Rob Lowe as Sam Seaborne filled the first few frames of THE WEST WING pilot on NBC. All that backstory, nostalgic as it was, was easily laughed off and water under the bridge as Dawn and I got talking not about the cable past, but about the digital future, as embodied in such titles as Glamour’s “Fashion Week Ride Along” with my Swarthmore classmate Cindi Leive and, my favorite title so far, “Angry Nerd,” based on the regular feature in Wired. Have a look at an installment of Angry Nerd, below, and have a listen to my conversation with Dawn, above. My other guest this week, Ben Smith (@buzzfeedben), is currently one of America’s most celebrated journalists, but he dismisses all the hubbub with shrug and a nod to the fundamentally strong stories and alluring listicles that his newsroom is turning out 24/7. Ben’s blase take on all the buzz about Buzzfeed is embodied in his understated role in the recent HOUSE OF CARDS send-up of Nerdprom, the annual dinner of the the White House Correspondents Association. Ben and I cover a lot of ground, from l’affaire Ed Snowden to Hillary Clinton’s first tweet to nothing less than the future of news. Truth is, you could decide to follow 100 different people on Twitter, but if you only follow @buzzfeedben, you’re not missing much of the conversation.